Did PBS ‘Break the Silence’ or ‘Break the Wind’? The film 'Basic Instinct' sparked outrage and protest by the lesbian community because the movie finally recognized lesbians as a group, but portrayed a lesbian as a murderer. The film 'Shakes the Clown' caused a similar reaction by the clowning industry when clowns were finally recognized as a group, but a clown was portrayed as a drunk. The documentary 'Breaking the Silence' is inciting much outrage by fathers because custodial fathers were finally recognized as a group, but all the fathers were identified as child abusers. The lesbians and clowns were reacting to a fictional screenplay whose writer had the luxury of portraying anyone as a murderer or a drunk, but consciously decided to choose one of them. Fathers across the country are reacting to a 'factual' documentary whose writer had the luxury of disclosing any single parent abusing their children, but consciously decided to choose fathers. Many fathers are trying to uncover the hidden agenda and conspiracy theory that motivated this attack on custodial fathers that is promoted by the creator as a "Children's Story". Is the Public Broadcasting Service (PBS) attempting to indoctrinate our children to hate their father? Is the Mary Kay Ash Foundation attempting to fund the elimination of the Parental Alienation Syndrome (PAS), or attempting to validate the Violence Against Women Act (VAWA)? As stated on the PBS website: "PBS's reputation for quality reflects the public's trust in the editorial integrity of PBS content and the process by which it is produced and distributed. To maintain that trust, PBS and its member stations are responsible for shielding the creative and editorial processes from political pressure or improper influence from funders or other sources. PBS also must make every effort to ensure that the content it distributes satisfies those editorial standards designed to assure integrity." The creators of this PBS expose' attempt to illuminate the seamy underbelly and sinister underpinnings of a secret threat to our children that has been so diligently covered up by the media. The investigation focused on 15% of the 14 million parents who were awarded custody of their children by order of the Family Court. Using the domestic violence allegation data from the recent Congressional hearings regarding Violence Against Women, and the hip-hop regarding 70% of all fathers who want custody gets it, and the allegations of Judicial corruption from the NOW Family Court Report- this crack team of experts chose to find 'abused' children amongst custodial fathers and allege that PAS is junk science. The cover story of Time magazine (12-95) also attempted to identify a threat to our children, but it was not advertised as a children's story. The magazine cover showed a perfect angel who was swept into a series of unfortunate events after her mother wrestled custody from her father. The story was entitled: 'Abandoned to her Fate', 'Neighbors, teachers, and the authorities all knew Elisa Esquardo was being abused, but somehow nobody managed to stop it'. 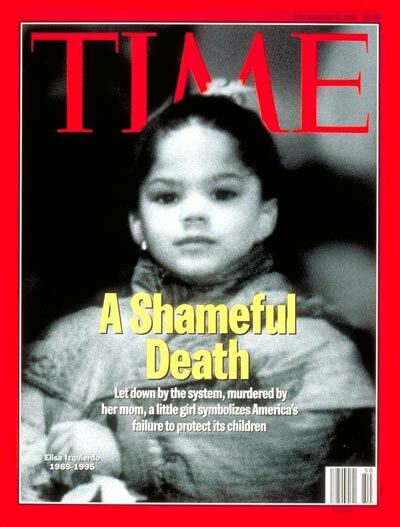 Time magazine did not focus their attention on finding more 'abused' children amongst custodial mothers and allege that Post Partum Depression, Premenstrual Syndrome, and Munchausen’s by Proxy Syndrome were junk science. Time magazine looked into the Family Court system, and then took a close look at Foster Care, and I wish they had kept up the good work. The silence is still unbroken regarding the Family Law system that provokes and encourages broken families, which increases the likelihood of child neglect or abuse. The Foster Care industry will not receive Federal funding if the number of children captured by the system does not continue to grow. Forcing custody of the children on the parent who is financially unable to support them also serves to maximize the cash flow between parents through the court. An aggressive child support award may allow Child Support Enforcement (CSE) and Temporary Aid to Needy Families (TANF) to finally reap Federal funding when the breadwinning parent is driven to self-unemployment. The CSE, TANF, and Foster Care costs must be repaid with interest by the self-employed parent who was taken from the lives of their children. Fathers, who have already had their fill of defending themselves against baseless allegations in Family Court, are constantly being forced to defend fathers in general from an endless barrage of the same. Books are being written celebrating the success of single mothers and lesbians in separating fathers from exceptional children: ‘Raising Boys Without Men: How Maverick Moms Are Creating the Next Generation of Exceptional Men’ by Peggy Drexler. Are fathers supposed to retaliate by funding the creation of ‘Raising Girls Without Women: How Maverick Dads Are Creating the Next Generation of Exceptional Women’ by Bob Uecker? Are fathers expected to fund a feature film to allege the truth to combat this infamy launched by those paid by the taxpayers to do it? The victims of Family Law and others are forced to wage war on the Divorce Industry without taxpayer funding. Glenn Sacks is currently demanding equal time on behalf of fathers regarding PBS programming. Michael Robinson is keeping Shared Parenting on the table and helping the legislature evaluate the status of men in Sacramento. David Burroughs is making sure fathers and the victims of misdirected anguish are being heard regarding the VAWA renewal on Capital Hill. Stephen Baskerville continues to deliver the ‘coups de grâce’ to Family Law in many highly respected publications. Wendy McElroy and Phyllis Schlafly continue to convince the public that gender has nothing to do with it. California parents of all genders are gathering signatures until this February to push the Shared Parenting ballot Initiative. Many others continue to somehow protest the Family Law system in any way they see fit. Parents who wish to stop funding the opposition may realize they must stop paying taxes.